Hear Hazel Dickens Peform On Mountain Stage The bluegrass pioneer died on Friday at the age of 75. Hear a Mountain Stage performance from the West Virginia treasure, recorded live in 1997. 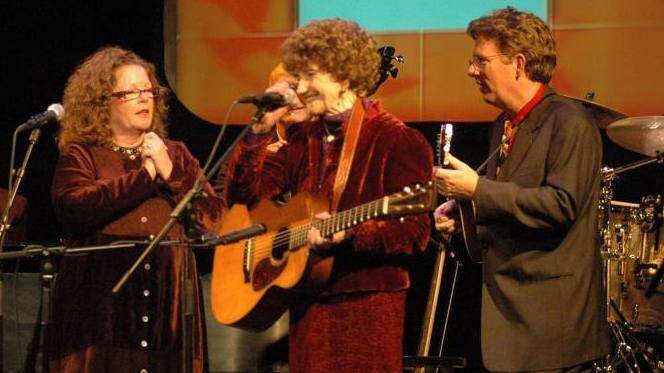 Pioneering folk singer Hazel Dickens, center, performs with Mollie and Tim O'Brien in 1997. Dickens died on Friday, April 22, at the age of 75. "You'll Get No More of Me"
On Tuesday, April 26, 2011, Hazel Dickens was laid to rest in Princeton, W. Va. If ever one voice captured the spirit of the hard-scrabble southern West Virginia coal fields, it was hers. When you hear Hazel's voice and songs, many words come to mind: honest, weathered, plain, deep, country, bold, distilled and undiluted, rugged and maybe a bit ragged. May Hazel rest in peace as her songs live on in the hearts of many. This performance was recorded in 1997 on Mountain Stage's 400th episode. She performs three of her own songs, plus "Coal Tatoo" by another West Virginian, Billy Edd Wheeler.